In a world where there seems to be a technological solution for everything, why can’t advertising fraud be stopped? Ever played Whack-a-Mole? Recently Procter & Gamble cancelled 1.8 billion dollars of digital advertising spend globally and saw no decline of sales. For a company that is famous for running prosaic, but effective, advertising, that is a shock. But it is clear that P&G had been paying for fraudulent traffic…like almost every other major digital advertiser. Now the venerable Financial Times audited its own inventory, and compared it to the inventory said to be available on re-seller-networks. It found that many ad-networks were offering fake impressions promised to be on the FT, when the FT doesn’t work with them. 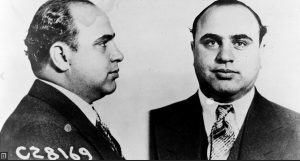 Al Capone: Would have been a digital media fraudster if the internet had been invented earlier. In short, gangsters are everywhere syphoning off a significant portion of legitimate advertising revenue that would go to legitimate publishers. There are three problems to be solved with ad-fraud and fake news, but they are intimately linked. First there is click-fraud. Small, and unknown, sites have grown now for almost two decades relying on advertising sent to their site by ad networks like Googles Adsense and others. 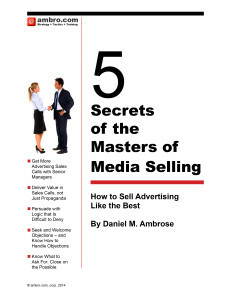 Some of these publishers, with no interest in running a real business, set up a site, publish the per-click ads, then hire an off-shore firm or bots to click on their ads…collecting the fraudulently earned advertising dollars from legitimate advertisers. Google has attempted identify the sources of click-fraud and ban them from the system, but as soon as an algorithm is written to identify cheaters, the cheaters write a new bot program to spoof the formula. Next came the “display” ad-networks who created an easy and inexpensive way for a new web site to sign up to receive and serve display ads — no clicks necessary — and collect money. Display ads earn advertising dollars for simply being shown; Meeting a standard set by the IAB for visibility other technical algorithm by any one of a number of verification firms engaged by advertisers. What that means is, if a publisher can fool the network into thinking it is legit they’ll get ads and money sent their way. Again, first cheaters did their cheating with human click-farms in third-world countries, then bots. While verification software routines have been created to identify and block these, the cheaters just write new software to spoof the routine. Forgive me if I make the writing of bot software to fool verification routines sound easy. It is not. But the amount of money available for successful cheaters is so stupendous that very smart people work very hard to leapfrog each verification innovation. Finally, the third problem to be solved to make digital advertising safe again is that many legitimate publishers have built their business on paying for traffic through online marketing and promotion. Too many of them are paying for fraudulent traffic. These publishers post perfectly legitimate articles, and spend money to promote them. If they pay less for the new traffic they acquire than they earn from a page view with ads on it, they increase their profit beyond the natural level dictated by their natural traffic. But since there is money to be made by sending traffic, cheaters used their click farms, then their bots, and finally more and more sophisticated bots that could move the mouse or scroll the page to fool the monitoring software and gather the revenue by sending fake reader traffic. The solution of preventing ad-media fraud by creating an approved list, to which advertisers limit their advertising, to will only solve 1/2 of the problem. Advertising on known sites is a start. The Ads.Txt solution promoted by the IAB is a step in the right direction. However, I am certain that someone more venal and clever that I will create work-arounds to spoof the Ads.Txt solution. But then the traffic to those known sites must be verified to be real. This is where auditing comes in. Every site in the “approved list” that pays for traffic, must have that traffic audited back to it’s source. Most digital publishers pay for advertising to bring traffic to their articles. Taboola and Outbrain are two companies that have made a business of enabling publishers to buy traffic by posting their content promotions on other sites, and visa versa. With publishers offering money for traffic, from sites the publisher doesn’t specifically know, they open themselves up to fraudulent traffic. This means even publishers that aim to be legitimate may be supporting fraud. ← What do CEOs and CROs Need to Know About Programmatic Advertising?